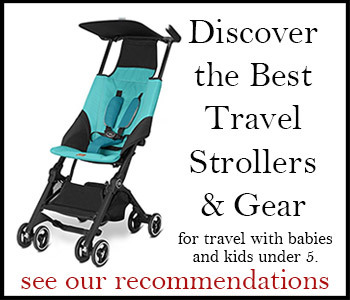 Here are my recommended travel stroller accessories to help make the most of your trip, including weather and insect protection, stroller travel bags, sun canopy extensions, parent organizers, and more. You can also find more helpful accessories for your stroller in Car Seat Accessories. Most travel strollers have small canopies that offer little sun protection. The Ray Shade slips over that slim canopy and extends well over your child whenever extra sun protection is desired, and retracts back out of the way or rolls into its own storage pouch when not needed. Includes pockets on the back to hold a cup and other essentials. The RayShade can be used with virtually all single strollers, jogging strollers, and bassinet/buggies with canopies. A double RayShade is also available for side-by-side twin strollers. Most lightweight travel strollers come with few bells and whistles, and even fewer storage pockets. This stroller organizer adds some very useful features and functionality you’ll especially appreciate on the go. Clip on the adjustable stroller organizer and gain two expandable cup or bottle holders; three zippered pockets and one flat pocket for diapers, binkies, and such. Plus an expandable mesh pocket that can handle those odd-size toys as well as wet or sticky clothing as you travel. This insulated stroller organizer keeps bottles, snacks and teething toys cool while giving you extra storage space on your stroller–then converting to a regular diaper bag with shoulder carrying strap (perfect for flights when you gate-check your stroller!). Two adjustable buckle straps and a center Velcro strap allow you to attach the cooler to your stroller basket or side bars. Includes two large front pockets and two side mesh pockets, with a flat zippered pocket that runs the width of the bag. Bonus: The low center of gravity makes lightweight travel strollers less “tippy” when the child is removed from the stroller. Great value and good padding to protect your stroller for gate-checking or checking through the entire baggage system. The top-loading feature also helps you pack up quickly at the gate without wrestling your stroller and bag on the floor among the boarding passengers. This versatile bag fits most single lightweight travel strollers with an umbrella-style fold, including Peg Perego, Maclaren lightweights (not the Techno XT), Combi, Graco, Jeep, Maxi Cosi, Inglesina, and others. Padded handles and an adjustable shoulder strap, with luggage ID pocket. Measures 41″ x 15″ x 10″. For double strollers, see below. It simplifies traveling with double strollers like those from Phil & Ted, Peg Perego, and Joovy, while also accommodating some bulkier singles like Bugaboo and Bob single joggers. As you’d expect, it also fits most twin travel strollers as well, including Chicco Twins, Combi Twins, and Maclaren twins. You and the guys gate-checking this bag will appreciate the padded handles and adjustable shoulder carrying strap, which can be removed for times when you check it through the baggage system (just tuck it inside and it will be ready to clip back on arrival). Includes luggage ID pocket and small zip outer pocket. Measures approximately 42″ x 21″ x 13″. Mosquitoes and other insects can be terribly persistent, not to mention many biting insects linger near the ground. With an elastic hem around its entire edge, this mosquito net provides a snug fit around all sides of most single strollers (tuck it up under the leg rest or feet for best fit). You may also use this mosquito net with most bassinets. You might also like this post on Insect Repellent Clothing for Babies and Toddlers. Sometimes it’s easier to take two single strollers rather than a double. But when you want to link umbrella strollers up for a single pusher (like when both kids are sleeping through the airport before the redye flight), these stroller links connect the two. Tip: Works best with strollers with narrower tubing (as shown), not the larger oval-shaped tubes found on some travel strollers. Some kids are too big for the stroller–until they’ve walked enough city blocks or need to catch that connecting flight in a hurry. This ride-on stroller board attaches to most popular travel strollers when you need it, and easily detaches for when you don’t (a quick-release feature lets you remove the board without removing the mounts).